The "Trend pullback demo" Expert Advisor uses two strategies: the first is price action strategy and trend lines, and the second strategy is the accumulation and distribution strategy and trend lines:https://bit.ly/2VkvBh8. 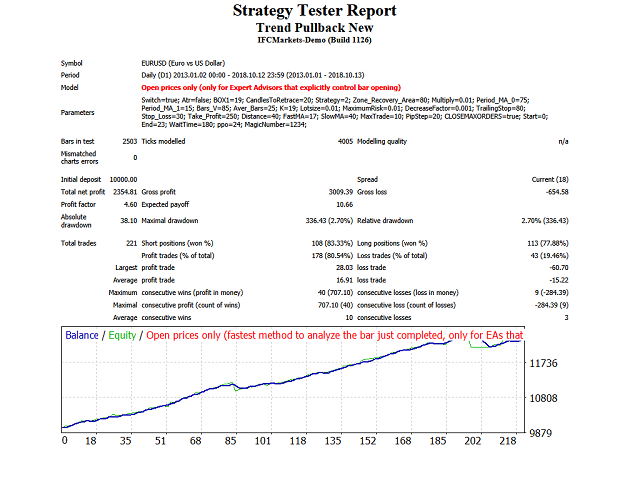 "Trend pullback" Expert Advisor uses 4 Different strategies to trade with two modes: the first is price action strategy, and the second strategy is the accumulation and distribution strategy,It can trade with all time frames . If "Switch" = "true" the EA uses price action strategy strategies. If "Switch" = "false" the EA trades with accumulation and distribution strategy. The demo version of the EA can work only with "EURUSD"
Switch - When "Switch" = "true" price action strategies, When "Switch" = "false" accumulation and distribution strategy. The stop loss was activated only if the trade went in the right direction for some pips. Now it is activated and visible from the start. Also there is the new stop command that accepts the value of the "ATR" indicator for double guard. And now the EA uses volume to identify changes in the market. If Strategy = "Trailing stop" - regular trailing stop loss. If Strategy = "Martingale" - if you lose a trade next trade will be with multiplied lot size. If Strategy = "Zone Recovery" - Zone recovery area hedging strategy. Zone_Recovery_Area - Zone Recovery Area (in pips). Multiply - lot multiplier for martingale strategy. The demo version of the EA can work only with "EURUSD".